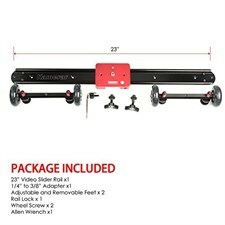 This newly Kamerar slider dolly SD-1 is a unique linear video camera slider which combined adjustable axles with smooth bearing dolly wheels. The SD-1 can also be mounted on tripod using either 1/4"-20 or 3/8" threads centered under the slider. It's the most versatile slider on the market that can be widely used on all kinds of professional camcorders, SLR, DSLR cameras etc. 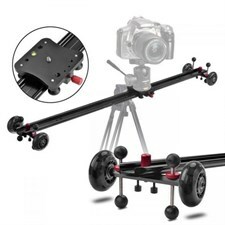 The Kingjoy 150cm Slider is a video stabilising system designed for DSLR film making in mind. It allows you to produce smooth, gliding footage of every scene you record. It reduces shakes and stabilises your video footage. 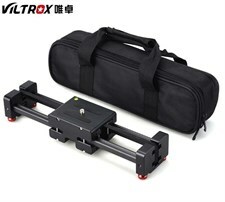 It can be used with all types of cameras and camcorders. You can attach the slider to a tripod which allows you to get similar shots to if you were using a small jib. The slider can be used in various different orientations, including upside down, diagonally and even vertically. The slider carriage also has a 3/8" thread so you attach any standard tripod head, which allows you to get shots at various different angles and orientations. The legs of the slider are detachable so you can use it on table tops. They are fully adjustable so you can keep it steady on uneven surfaces. The slider also has a built in spirit level so you can always see if the slider is level.